This post is an updated version of a Dover blog originally posted in 2014. It’s crazy that here we are four years later, and this content is still relevant: No matter how big or small our home space is, we all need smart, storage and built-in conveniences to help keep us organized. I’ve updated this post with recent project photos to give it a more modern spin. Enjoy! Is it just me, or are we all busier today than we were five years ago? As I meet with customers, I reaffirm my stand that young families, empty-nesters and newlyweds alike are all busier than ever these days with careers, school, extracurricular and volunteer activities… the list goes on. What’s great about our industry is that as people seem to be getting busier, we’re designing home remodeling solutions that keep getting smarter to make everyday life a little easier. Here are two project ideas/spaces that we’re remodeling these days that go a long way toward making our customers’ lives more organized, efficient—and stress-free. Many homes have a space off the garage that is an entryway and laundry room combination. For families with school-aged children, these rooms are cluttered with backpacks, shoes, sports equipment, instruments…and we haven’t even hit winter weather season when the load doubles with boots, gloves, hats and more. For some customers, we’ve relocated the laundry to another space within the home and for others, we’ve added on square footage to create a smart, well-organized mudroom. In either scenario, these newly fashioned areas typically feature lockers (or cubbies) that provide individual spaces for hanging and storing items. A built-in storage bench makes getting shoes and boots on/off a breeze. Hooks and shelves inside each locker keep it all in order, from backpacks to coats. 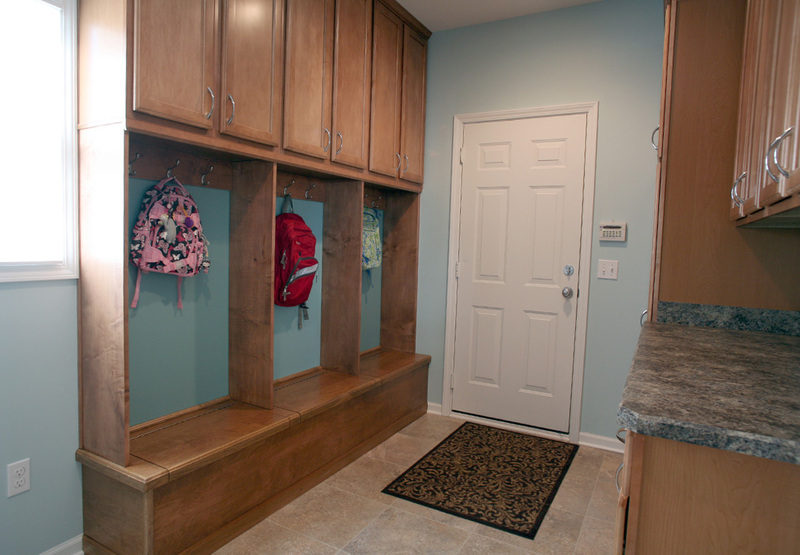 Our customers are thrilled to have a full-functioning mudroom that not only maximizes the space, but that gives their kids their very own space that cuts down on clutter, is easy to maintain and helps to eliminate the headache of lost or misplaced items. Many homes built in the 80s and 90s have a built-in planning desk in the kitchen. In this age of laptops and tablets, these desks are rarely used and have inevitably become junk-collectors. Our designers have developed a host of smart solutions that turn these spaces into charging stations or drop zones that provide pure function for customers. Recent renovations have included custom pantry shelves or drawers with built-in charging access for phones and tablets; slots for organizing paperwork or mail; hooks for keys; and shelves for catch-all items. These re-purposed spaces are the ultimate organizing tools, tucking away all the essential tech gadgets and miscellaneous items, yet keeping them close at hand for easy access. 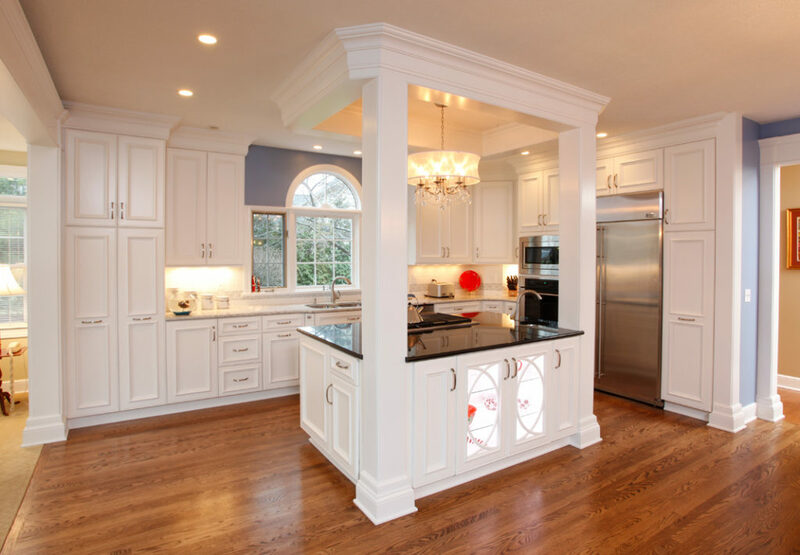 The bonus is that these renovations often add more counter space and even a design element with glass-front display cabinetry. I know I speak for many of us when I say that I have great intentions for getting organized—and then staying on top of it all. These solutions are great examples of small-scale organization/renovation projects that have a big impact, making everyday life a whole lot easier.